Yesterday, when RBC Royal Bank announced that it was lowering its five-year fixed mortgage rate it came as no surprise to industry insiders. 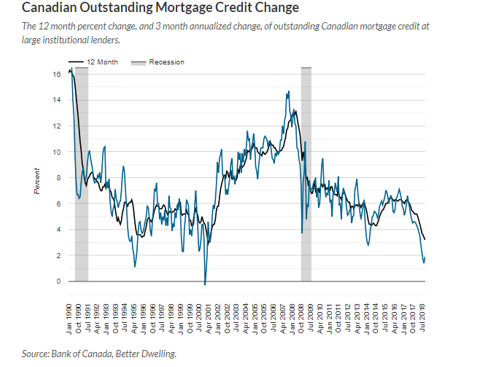 The combination of falling bond yields and weakening mortgage demand have teamed up to put considerable pressure on all aspects of the Canadian mortgage market. Granted the drop in RBC’s posted rate was just 15 basis points, from 3.89 % to 3.74 %, nonetheless, it does signal that the recent rate hikes by the Bank of Canada are not been transmitted into higher rates across the yield curve; in fact, just the opposite as the yield has flattened. So much of the reporting in the financial press erroneously touted that mortgage rates were going to continue to rise and that borrowers should be preparing for difficulties in re-financing or borrowing anew. The bond market never bought into this storyline. Ever since the Bank of Canada starting raising its bank rate in July 2018, the yields on the 5-year bond, the one most influential in determining mortgage rates, started to fall and now resides at less than 1.9 %. The wholesale cost of money to the banks dropped sufficiently that the banks could drop mortgage rates and still maintain required net margins. When it comes to the housing market, governments should be careful what they wish for. About a year ago, the Canadian government expressed real concern over the steady rise in housing prices, especially in the large metropolitan areas and instituted a series of measures to cool mortgage demand. These measures were aimed at fending off any systematic risks by making it more difficult to obtain high loan-to-value mortgages and also to weed out high loan-to-income borrowers. As the accompanying chart demonstrates, the negative impact on mortgage demand was relatively swift. Part and parcel of the slump in mortgage loan demand was the significant fall off in housing starts. Annualized, housing starts in Canada dropped by 5 % in December compared to November. As new homes purchases declined, developers became ever more cautious about starting new projects.